Nuclear Medicine Camera – Cutting the Ribbon! Friends and supporters came to Bertrand Chaffee Hospital as staff, providers, board members and elected officials helped to cut the ribbon for the nuclear medicine camera. This piece of equipment was replaced with an upgraded model in March thanks to funding from the New York State Department of Health and a grant from the Springville-Griffith Community Education Foundation. 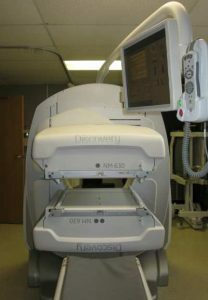 Bertrand Chaffee Hospital has upgraded its nuclear medicine camera equipment as of March with support from the New York State Department of Health and its Statewide Healthcare Facility Transformation Program. Studies available with this nuclear medicine camera include: scans of bone, lung, spleen, thyroid, liver, brain, and breast; scans for GI bleeding and gastric emptying; a white blood cell extremity scan; and, cardiac stress and cardiac non-stress scans. Nuclear medicine exams will be available weekdays from 8 a.m. until 3 p.m. Please call the BCH Heart Center for appointments at (716) 592-9644.